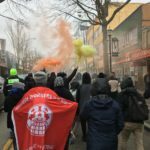 January 20th, 2017 is a day that many of us remember as tumultuous, repressive, and traumatizing – a day that pointed towards an uncertain future full of certain struggle. It was on this day that neoliberal state actors both facilitated and supported the procedures and policies that allowed a molesting bigot on a populist fascistic platform take office in what is arguably the most highly-regarded seat of violently concentrated political power on Earth. It was a day that the protests against such a revolting spectacle led to the indiscriminate arrest of 188 protesters and journalists in Washington D.C. during the inauguration – a third of which still have charges that could result in decades behind bars hanging over their heads. 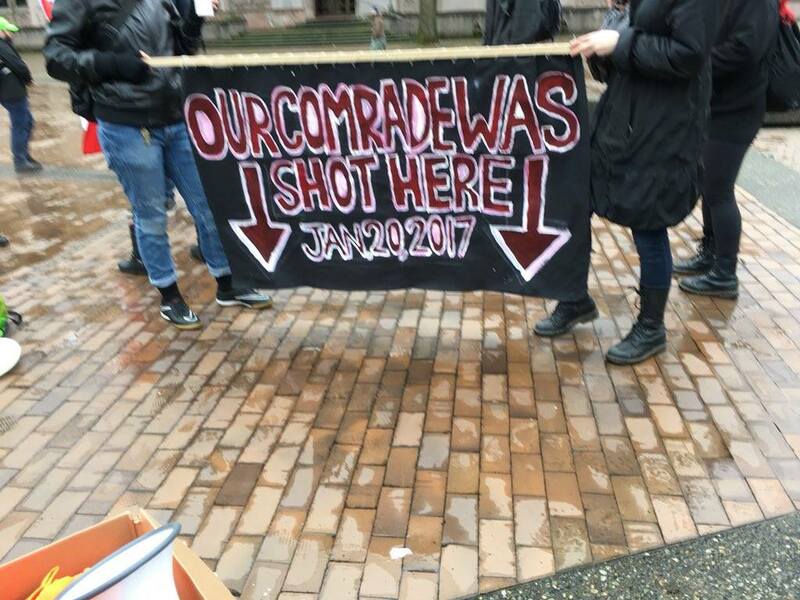 January 20th, 2017 was also a day of agony for the Greater Seattle IWW General Defense Committee as one of our own was nearly taken from us in an attempted murder by a supporter of bigot and former Breitbart editor, Milo Yiannopoulos, who was given a platform by the University of Washington to spew his vitriol in Kane Hall on campus that night. 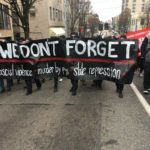 As he was attempting to de-escalate a conflict during the protest, the gunshot that nearly killed our fellow worker and defender rang through the square that night, it tore into his partner, his family, his friends, and his community, which has left wounds that may never heal and abundant scars to show for it. A year later, members of the Greater Seattle General Defense Committee, the Seattle Industrial Workers of the World, and many more sympathetic leftist and radical hearts and minds, gathered to commemorate the events of that day one year ago, in both remembrance of what happened here in Seattle as well as across Turtle Island, to create catharsis as well as produce a resounding statement that made it clear that we don’t forget. That we know and understand the threats we work around and within. That together, we are yet unafraid and that we do persevere stronger than ever. The day’s rally began at the very spot our fellow defender was shot. Revolution Staging amped the crowd up with a poignant playlist played over their loudspeakers. 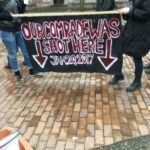 Speeches were made by many friends and comrades who were there that very day a year ago, letting loose against the UW administration, UWPD, the SPD pigs, who murdered pregnant black mother Charleena Lyles last year, and the College Republicans – who quite intentionally set up a propaganda booth right across from the rally. What likely was thought by them as a coy chance to provocatively push their poison inevitably turned into an amplified and merciless roast of them and every form of oppressive ideal that they complicitly stand for and with. 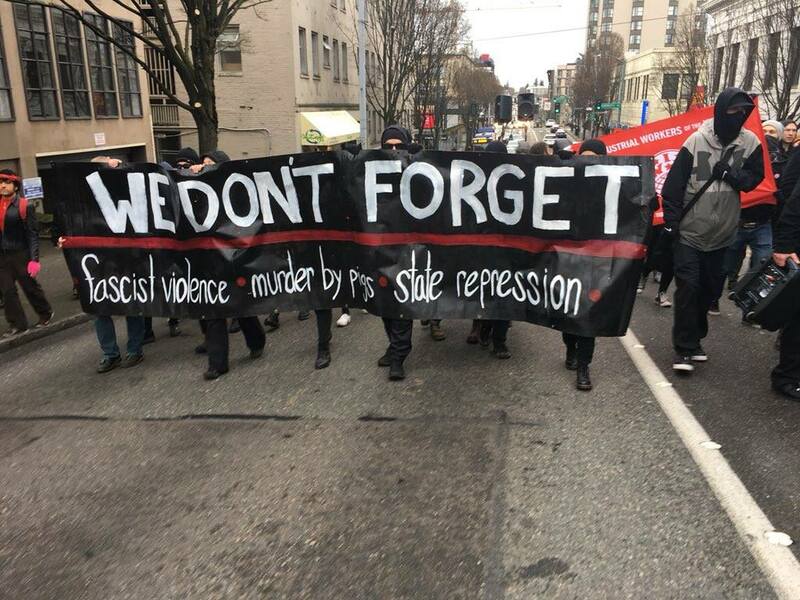 It is worth noting that standing with them that day was none other than Cascade Legion neo-Nazi leader, Christopher Robertson. Despite the amusingly muted jeers and ignored attempts for pointless debate from the College Republicans, local musicians performed and the DJ blasted songs throughout the square. Not much later began a rousing march through the campus and down the University Avenue main thoroughfare. 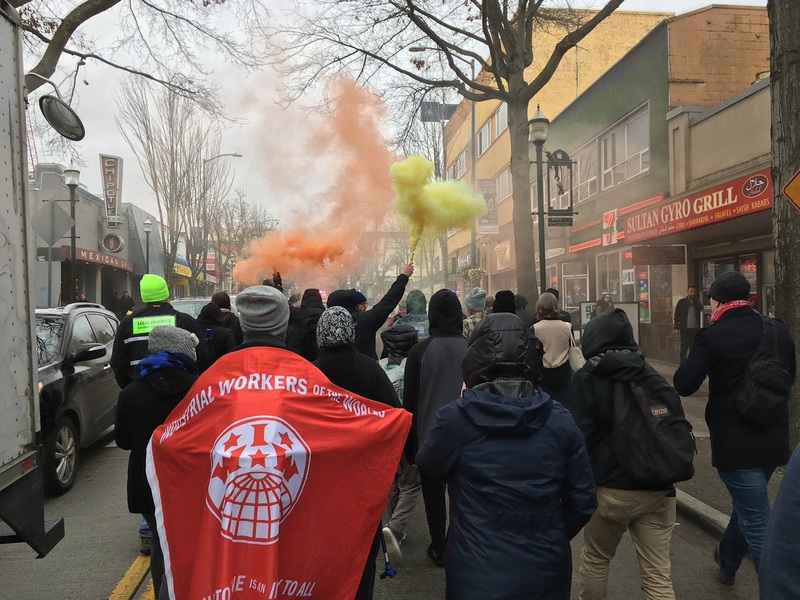 There was no shortage of visibility in a beautiful display of solidarity, strength, and life-giving disruption in an otherwise bleak world of manufactured order. The contingent returned to Red Square to disperse, marshals offered escorts to those leaving, all were accounted for, everyone safe this time – all had gone without a hitch, undoubtedly much to everyone’s relief. We hope to see in this coming year a defiant retort to any and all repression. That we cannot be held back, whether that’s at the end of a gun or under a judge’s gavel. We must work to produce truly liberatory avenues on which we can find solace from a world built on hierarchies, exploitation, and bigotry. We most certainly and most importantly must not forget.